The Wild Nords Slot is a five reels slot with three rows and 20 paylines. The game comes from Red Tiger Gaming and is playable on desktops, tablets and smartphones. Starting at 20p, the reels of the Wild North slot can spin up to a maximum bet of £500. The slot has a Viking theme in comic style and the paylines pay both ways. There are some lucrative as entertaining bonus feature. These include various wild symbols, several re-spins feature and the Animal feature. The top prize of the game is 1000x your bet! Symbols and Payouts: The symbols of Wild Nords Slot are in a comic style and include theme symbols and playing cards symbols. Last mentioned symbols are your low paying symbols and pay up to 60x your bet. Theme icons include three different wood sign icons in shades of green, blue and red. The blue wood shield is the most valuable and pays up to 200x your bet. There are also three wild symbols Rolf, Bjorn and Astrid which pay up to 300x your bet. Wild Re-Spins feature: The Wild North slot has three different wild symbols, which are the Bakraktäre Bjorn, Rolf and Astrid. Each of these icons has its own feature. Bjorn transforms the Bear Shild symbols into Wilds and triggers a re-spin. Rolf turns the Wolf Shield symbol into Wilds and also triggers Re-Spins until no Wolf icon lands on your reels. Astrid is the last wild symbol that transforms the Eagle Shield symbol and triggers re-spins. Again, you’ll get re-spins until no Eagle symbol pops up. Animal feature: The Wild Nords Slot does not offer a Free Spins feature, but it does have the Animal feature. You trigger this by chance when the scandinavian wild animals appear next to your reels. Then they add additional high value symbols to your reels, which means higher payouts. Just like with Astrid, Bjorn and Rolf you get re-spins again until the animals disappear again. Here you also have the best chance of winning the top prize of 1000x your bet, which means a payout of up to £500.000! Anyway, you can trigger the Wild re-spins and also the Animal feature very fast. 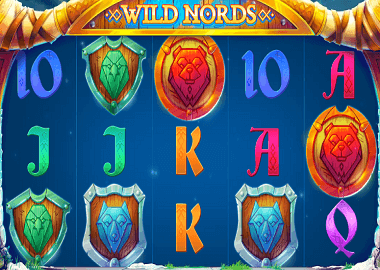 The Wild Nords Slot is an entertaining slot that generates a lot of excitement even without free spins. You can play the slot here for free by clicking on the banner above. You can find more Free Red Tiger Gaming Slots on the Review page or on our Free Slots page. Other slots from top vendors such as Netent, Play’nGo or even ELK Studios are also available. Recommended UK casinos with Red Tiger Gaming slots include Prospect Hall, Miami Dice or Spinland. In all three casinos you get a bonus and free spins after registration! All information about it you can read in the table below!